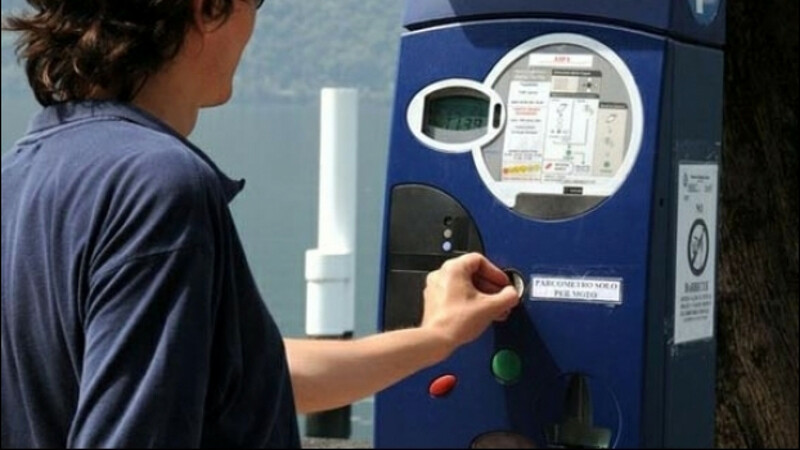 In Italy, how to know parking fee before driving into the parking lot? Is there a way to know the parking fee before driving into a parking lot in Italy? In many other countries there are boards with prices at the gateway, so you see the hour rates before you park. I have almost never seen such price boards in Italy. Am I missing something? Prices should be clearly marked and visibly displayed by law. Failing this you can try using Parkopedia which tends to keep up to date with parking prices around the world. Next hours fee (repeated for each hour). Usually paid parking have blue stripes and free ones are white, unless white ones are residential parkings for people who live there, in which case you will notice usually cars parked there will have some kind of ticket/permission with a letter on it to show they're actually people who live and park there and there should be a sign with the parking rules in the whereabouts. Here is an example of price label shown on such parking payment devices. Do you have an example of where you didn't find such information? I don't know exactly which parking lots you are referring to, but when you have that kind of parking lot where you take a ticket at the entrance, you also have a sign telling you what is the hour rate. This is a common type of parking also in italy and, as everywhere in the world, we have the prices shown at the entrance. There could be exception to that, as sometimes I also saw abroad missing prices at the entrance, but they are just a small minority. Not the answer you're looking for? Browse other questions tagged driving italy automobiles or ask your own question.